This is Wayback Wednesday, your midweek blast from the past! In this feature, we dig into the archives, look back at the history of basketball gaming, and indulge in some nostalgia. Check in every Wednesday for retrospectives and other features on older versions of NBA Live, NBA 2K, and old school basketball video games in general. You’ll also find old NLSC editorials re-published with added commentary, and other flashback content. 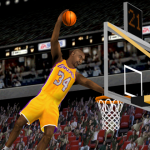 This week, I’m taking a look back at the Slam Dunk Contest in basketball video games. The Slam Dunk Contest is the main event of All-Star Saturday Night, and with the notable exception of the 1998 All-Star Weekend, it’s been a fixture of the festivities since 1984. Although not every contest has been better than the last – and indeed, some years have been downright disappointing – it’s still provided us with many memorable examples of spectacular aerial artistry. It only stands to reason that we want to take part in the dunk contest in basketball video games, and fortunately for us, several titles over the years have afforded us that opportunity. This is Wayback Wednesday, your midweek blast from the past! In this feature, we dig into the archives, look back at the history of basketball gaming, and indulge in some nostalgia. Check in every Wednesday for retrospectives and other features on older versions of NBA Live, NBA 2K, and old school basketball video games in general. You’ll also find old NLSC editorials re-published with added commentary, and other flashback content. 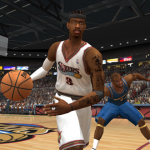 This week, I’m taking a look back at NBA 2K9 on PC. The fact that LeBron James is appearing in his eighth consecutive NBA Finals series hasn’t just sparked fierce debate among basketball fans in the endless Greatest of All-Time debate. It’s also a sign of how quickly the last few years have flown by, with LeBron’s tenure with the Miami Heat already becoming a distant memory. Another fact that may leave you wondering where the time has gone is the number of NBA 2K games that have come out on PC, which now stands at ten. It feels like only yesterday that the series was a newcomer to the platform, but it has indeed been a decade. This is Wayback Wednesday, your midweek blast from the past! In this feature, we dig into the archives, look back at the history of basketball gaming, and indulge in some nostalgia. Check in every Wednesday for retrospectives and other features on older versions of NBA Live, NBA 2K, and old school basketball video games in general. You’ll also find old NLSC editorials re-published with added commentary, and other flashback content. 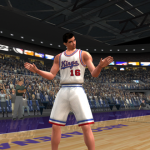 This week, I’m taking a look back at the three-point shootout in NBA Live 98. I’ve already talked a little about the three-point shootout in my Wayback Wednesday feature on All-Star Weekend Mode, as well as my retrospectives of NBA Live 98 and NBA Live 2005. However, it occurred to me that I’ve yet to dedicate a feature solely to the contest, which made its debut in NBA Live 98. 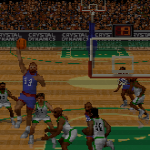 Although a three-point shootout had been featured in other basketball video games, the mode found in NBA Live 98 was, at the time, the best representation of the event on the virtual hardwood. As an item on the Wishlist, its addition was warmly welcomed by basketball gamers. This is Wayback Wednesday, your midweek blast from the past! In this feature, we dig into the archives, look back at the history of basketball gaming, and indulge in some nostalgia. Check in every Wednesday for retrospectives and other features on older versions of NBA Live, NBA 2K, and old school basketball video games in general. You’ll also find old NLSC editorials re-published with added commentary, and other flashback content. This week, I’m taking a look back at X-Factor players in NBA Live 07. It’s fair to say that NBA Live 07 is a standout release in the NBA Live series, albeit for the wrong reasons. The Xbox 360 version of the game is widely considered to be one of the worst basketball games ever, and the PC/PlayStation 2/Xbox version’s reputation isn’t much better. It notably experimented with three different shooting buttons, an idea that was interesting, but proved to be overkill. Looking back on it now, it wasn’t the best way of implementing advanced shooting controls. Despite the game’s struggles, however, it was trying new ideas that at least had good intentions. This is Wayback Wednesday, your midweek blast from the past! In this feature, we dig into the archives, look back at the history of basketball gaming, and indulge in some nostalgia. Check in every Wednesday for retrospectives and other features on older versions of NBA Live, NBA 2K, and old school basketball video games in general. You’ll also find old NLSC editorials re-published with added commentary, and other flashback content. 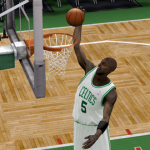 This week, I’m taking a look back at CustomArt in the PC versions of NBA Live. As I mentioned in my retrospective of NBA Live on PC, modding was a big part of what made those releases the definitive versions of the game through to around the mid 2000s. The modding scene was able to become as large and successful as it did due to EA Sports’ willingness to make the game files easier to modify. While we were never provided any official tools, changes such as the adoption of DBF files, as well as the organisation and relative consistency of the art file formats, kept the modding community productive and our Downloads database filled with great updates. This is Wayback Wednesday, your midweek blast from the past! In this feature, we dig into the archives, look back at the history of basketball gaming, and indulge in some nostalgia. Check in every Wednesday for retrospectives and other features on older versions of NBA Live, NBA 2K, and old school basketball video games in general. You’ll also find old NLSC editorials re-published with added commentary, and other flashback content. 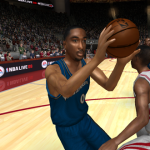 This week, I’m taking a look back at the history of NBA Live on PC. It’s been over ten years since a PC version of NBA Live was released. For a long time, the series was the only NBA game that was consistently released on PC as well as the consoles, but beginning with NBA Live 09, it’s been a console exclusive. In hindsight, the writing was on the wall as the last couple of PC releases were problematic, not to mention ports of the previous console generation. Although the NBA 2K series would make its way to PC – the very year NBA Live left it, in fact – there is still interest in seeing EA’s game return to the platform. Unfortunately, so far our Wishlist requests and petitions have not yet yielded the desired outcome. This is Wayback Wednesday, your midweek blast from the past! In this feature, we dig into the archives, look back at the history of basketball gaming, and indulge in some nostalgia. Check in every Wednesday for retrospectives and other features on older versions of NBA Live, NBA 2K, and old school basketball video games in general. You’ll also find old NLSC editorials re-published with added commentary, and other flashback content. 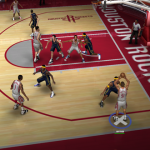 This week, I’m taking a look back at the Arcade mode settings that were once available in NBA Live. By definition, NBA Live has always been a sim title. 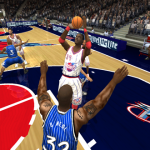 Granted, the level of realism hasn’t always been satisfactory, and in the case of certain releases – NBA Live 2003 in particular – the style of gameplay has skewed a little towards being arcade. However, there are several distinct features and concepts that define the arcade basketball game genre, such as exaggerated dunks, a lack of rules, and a more casual, “video game” approach to the setting and gameplay. Whatever shortcomings any NBA Live or NBA 2K title may have, they are – by design and concept – sim titles. Games like NBA Jam, NBA Street, and NBA Playgrounds, on the other hand, are arcade games. This is Wayback Wednesday, your midweek blast from the past! In this feature, we dig into the archives, look back at the history of basketball gaming, and indulge in some nostalgia. Check in every Wednesday for retrospectives and other features on older versions of NBA Live, NBA 2K, and old school basketball video games in general. You’ll also find old NLSC editorials re-published with added commentary, and other flashback content. 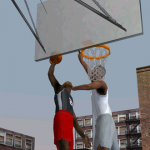 This week, I’m taking a look back at NBA Live 2000’s Michael Jordan in 1-on-1 mode. Today is Tim Duncan’s 42nd birthday. Not only is the future Hall of Famer one of the greatest players in NBA history, he also graced the cover of one of the best games in the NBA Live series: NBA Live 2000. Of course, he shared the cover with an insert of Michael Jordan, who made his first official appearance in the series as a member of the newly added roster of Legends. April 25th also marked a milestone in Michael Jordan’s career, as on this date twenty-five years ago he captured his seventh straight scoring title, tying a record set by Wilt Chamberlain. This is Wayback Wednesday, your midweek blast from the past! In this feature, we dig into the archives, look back at the history of basketball gaming, and indulge in some nostalgia. Check in every Wednesday for retrospectives and other features on older versions of NBA Live, NBA 2K, and old school basketball video games in general. You’ll also find old NLSC editorials re-published with added commentary, and other flashback content. 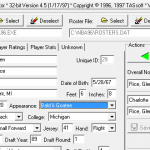 This week, I’m taking a look back at the NBA Live 96 Editor for Windows, also known as WNBA-Ed. Although obviously far surpassed by its successors, NBA Live 96 is still one of my all-time favourite games in the NBA Live series. It was the first NBA Live title that I owned on PC, having played NBA Live 95 on the Super Nintendo (although I would later pick up the PC version of NBA Live 95 as well). It’s also the game that led me to discover the NLSC when my family finally got connected to the Internet, and in turn, the hobby of modding (usually called patching at the time). As such, in addition to the fun I had with the game, it’s a sentimental favourite because of its connection to my history in discovering and joining the online basketball gaming community. This is Wayback Wednesday, your midweek blast from the past! In this feature, we dig into the archives, look back at the history of basketball gaming, and indulge in some nostalgia. Check in every Wednesday for retrospectives and other features on older versions of NBA Live, NBA 2K, and old school basketball video games in general. You’ll also find old NLSC editorials re-published with added commentary, and other flashback content. This week, I’m taking a look back at another topic related to NBA Live 2003, namely its step-back three-point exploit. Ensuring that a basketball video game is completely free of cheesy moves and other exploits is much easier said than done. As such, even today gamers will find tricks that aren’t realistic basketball strategy, but certainly effective against the CPU and other users alike. In older basketball video games, with their far more primitive AI and mechanics, simple strategies and reliable exploits tended to be the most effective means of picking up win after win. From the corner three in Double Dribble to the Outside Scorer moves in NBA Live 06, most games had at least one exploitable tactic. This is Wayback Wednesday, your midweek blast from the past! In this feature, we dig into the archives, look back at the history of basketball gaming, and indulge in some nostalgia. Check in every Wednesday for retrospectives and other features on older versions of NBA Live, NBA 2K, and old school basketball video games in general. You’ll also find old NLSC editorials re-published with added commentary, and other flashback content. This week, I’m taking a look back at a popular myth regarding a gameplay setting in NBA Live 2003. As I noted in my retrospective of NBA Live 2003, while the game was a landmark title in terms of introducing right stick dribbling controls, it came up short as far as the level of realism was concerned. Needless to say, despite our disappointment with that aspect of the gameplay, we did our best as a community to find ways of enhancing the experience. 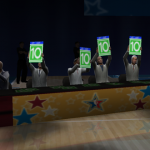 The most common was making mass tweaks to the ratings in order to alter the gameplay, but this had undesirable side effects in Franchise mode, especially when it came time for the game to generate a new class of fictional rookies. This is Wayback Wednesday, your midweek blast from the past! In this feature, we dig into the archives, look back at the history of basketball gaming, and indulge in some nostalgia. Check in every Wednesday for retrospectives and other features on older versions of NBA Live, NBA 2K, and old school basketball video games in general. You’ll also find old NLSC editorials re-published with added commentary, and other flashback content. 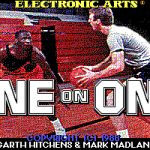 This week, I’m taking a look back at the PC version of Jordan vs Bird: One on One by Electronic Arts. In my retrospective of Lakers vs Celtics last year, I took a look back at one of the most famous forerunners to EA Sports’ NBA Live series. Although it was the first game in the NBA Playoffs series, and the oldest game in EA’s lineage of five-on-five titles, Lakers vs Celtics was not the developer’s first foray onto the virtual hardwood. That distinction belongs to the 1983 Apple II release commonly referred to as One on One, and alternatively as One on One: Dr. J vs. Larry Bird, or Dr. J and Larry Bird Go One on One. 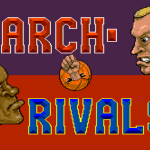 Featuring Julius Erving and Larry Bird going head to head in a one-on-one match-up, it was one of Electronic Arts’ early successes. This is Wayback Wednesday, your midweek blast from the past! In this feature, we dig into the archives, look back at the history of basketball gaming, and indulge in some nostalgia. Check in every Wednesday for retrospectives and other features on older versions of NBA Live, NBA 2K, and old school basketball video games in general. You’ll also find old NLSC editorials re-published with added commentary, and other flashback content. This week, I’m taking a look back at the PC version of Slam ‘N Jam. Back in the 90s, there were quite a few basketball video games that only licensed the name and likeness of a lone NBA star. Games like Michael Jordan in Flight, Barkley Shut Up & Jam, and David Robinson’s Supreme Court, all featured their namesake player alongside fictional teammates and opponents. In 1995, Crystal Dynamics (the developer responsible for Gex and Tomb Raider) and Left Field Productions (makers of Kobe Bryant in NBA Courtside) released a couple of games with the name Slam ‘N Jam. The first game, Slam ‘N Jam ’95, featured only fictional players. It was followed by a sequel in 1996, titled Slam ‘N’ Jam ’96 Featuring Magic & Kareem. This is Wayback Wednesday, your midweek blast from the past! In this feature, we dig into the archives, look back at the history of basketball gaming, and indulge in some nostalgia. Check in every Wednesday for retrospectives and other features on older versions of NBA Live, NBA 2K, and old school basketball video games in general. You’ll also find old NLSC editorials re-published with added commentary, and other flashback content. This week, I’m taking a look back at the ratings in classic NBA Jam games, specifically the PC version of NBA Jam Tournament Edition. While playing College Slam for last week’s Wayback Wednesday feature, I noticed something interesting about the individual player ratings. Since the generic players can be edited, there is a cap on their ratings to prevent you from maxing them out at nine in each category. Interestingly, the cap varies from player to player, which basically ensures that at least one player stands out as the star of the team with better all around ratings or high ratings in a few categories, while other players are capped at a lower amount of ratings points, establishing a hierarchy and balancing the squads.